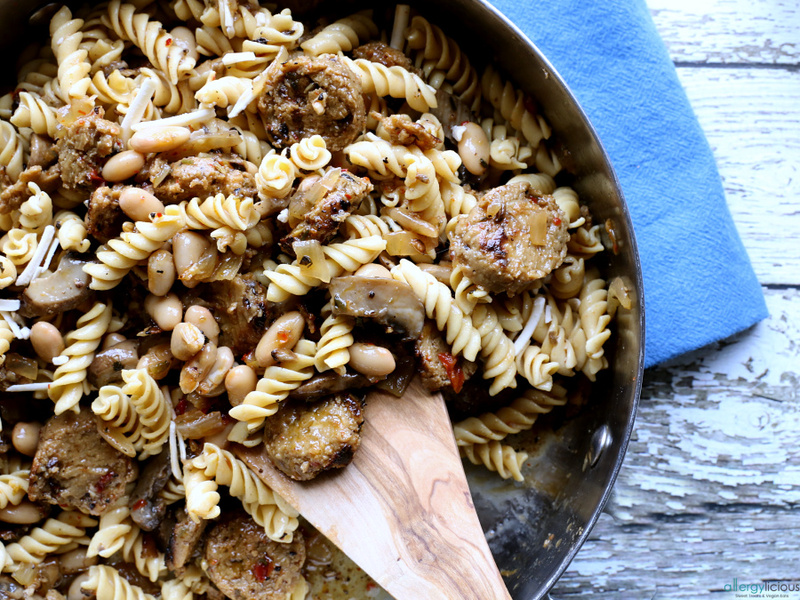 One pan, skillet pasta with sauteed mushrooms, white beans and vegan sausage! 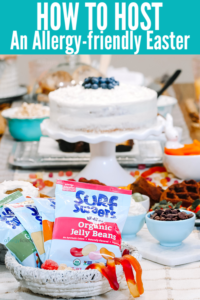 Even your picky eaters will love this! Do you ever have those evenings when you’re just feeling lazy about making dinner? Or maybe you’re just tired of spending more time cleaning up the mess, than you actually spend eating? Before you head to the drive through or spend money on dinner out, let me show you one of my kids favorite meals. This skillet pasta recipe takes less than 20 minutes from beginning to end and other than the pasta, everything can be made in 1 pan. Winner Winner Pasta Dinner!! A quick and easy skillet pasta, loaded with incredible flavor,,,, say it ain’t so! 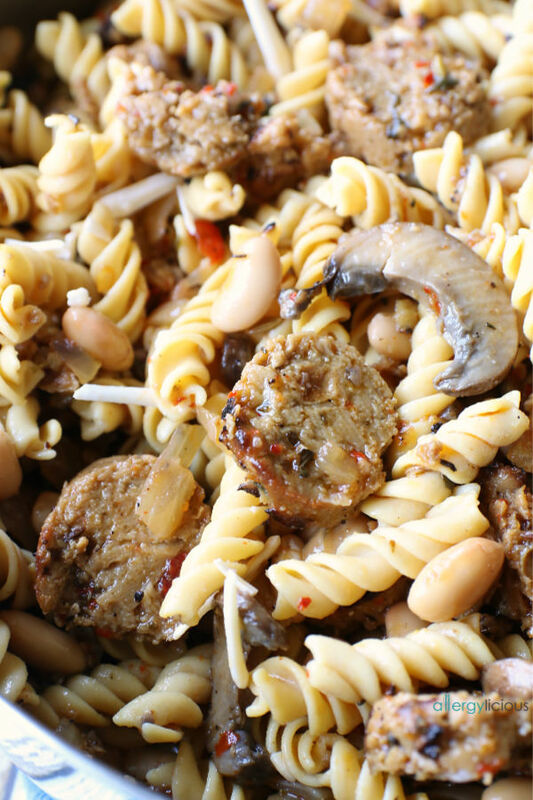 Delicious chunks of vegan Italian sausage are combined with veggie broth, onion, mushrooms, cannellini beans, gluten-free pasta, and shredded parmesan cheese for a healthy and comforting meal. You’ll love every bite. You’ll also love that this skillet pasta is very easy to customize, based on your dietary restrictions. For example…. Sausage – Tofurkey Italian Sausage is a delicious, plant-based product but it is not gluten-free. Since we’ve been doing more and more gluten-free to help with my daughter’s stomach issues, I’ve started making this with Hilary’s Spicy Veggie Sausage which is both vegan & gluten-free. 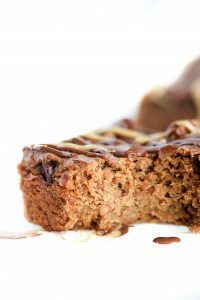 Carnivore friends, well, you can either sub in your favorite brand OR how about trying this plant-based version first. I promise you won’t miss it one bit! 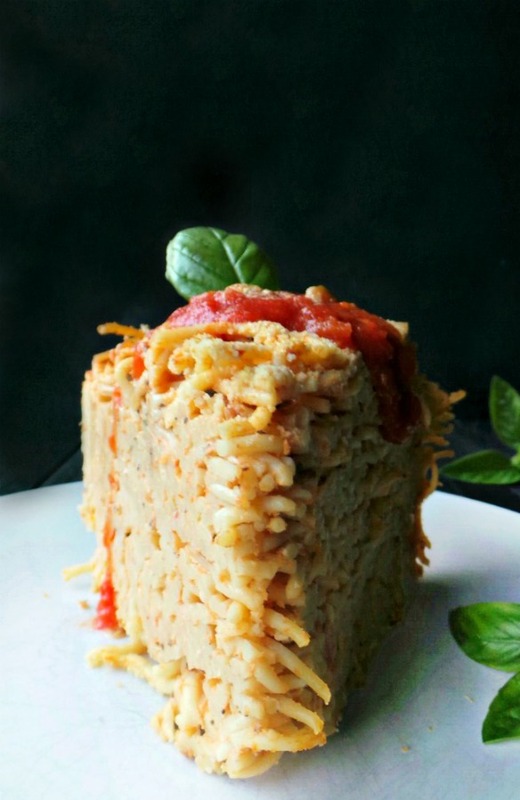 Shredded Parmesan – Follow Your Heart makes an amazing vegan and gluten-free shredded parm. It’s like sprinkling on a little taste of Italy. If you want a more melty-cheezy topping, then add a little Daiya shredded mozzarella. No one ever complained about having too much cheesiness. Pasta – Pick your favorite noodles here BUT, if you are looking for a protein packed, plant-based pasta that is also gluten-free, then you need to try Banza . Chickpeas are the base for this brand and creates the stability so you don’t get “mushy” pasta. Doesn’t everything about this this just look and sound delicious? It is the kind of meal you can survive on all fall and winter. Good for you ingredients, comforting flavors and most importantly, ridiculously easy to make. Try this pasta dish the next time you want a fast home-cooked meal. I promise, it’ll be quicker and healthier than ordering takeout! In a large pot of boiling, generously salted water, cook pasta according to package instructions until al dente; drain well but reserve 1 cup. Heat 1 tablespoon olive oil in a large skillet over medium high heat. Add crumbled sausage and cook, stirring until browned. Transfer to a plate and set aside. Return pan to stove and heat 1 tablespoon oil again over medium heat. Add onion and mushrooms, and cook until onion and softened and mushrooms are golden, about 6 minutes. Add broth, scraping off bits from bottom of pan. Add beans, thyme, red pepper flakes and reserved sausage with any liquid from it. Season with salt and pepper and let simmer until mixture has thickened slightly. When sauce veggie mixture is ready, pour noodles over mix and add a splash of lemon juice. Toss to combine. If pasta looks too dry, add a little of the reserved pasta water. Season more to taste and serve with shredded parmesan cheese. Wow does this look delicious! 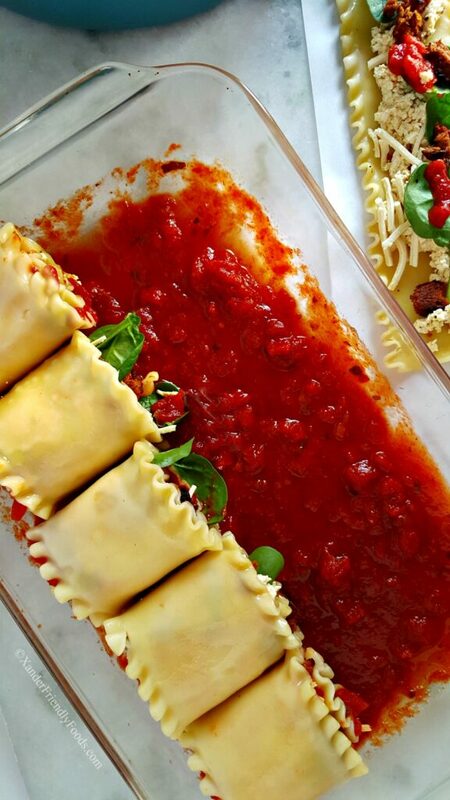 Pasta is a weakness of mine so this will certainly be added to my rotation! Such a beautiful Fall dish. You’re right though, rice noodles do have a tendency to be mushy after a while. Choose a pasta made with corn or quinoa to help with the structure – or Banza like you said! Love how easy this is! I have some Hilary’s in the freezer so that’s what ill be using. The sausage and bean combo is a classic one! 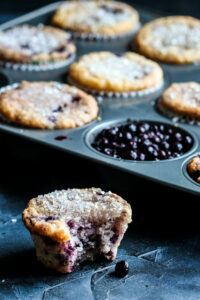 This looks so comfy and delicious….bring on all the comfort foods! ooh, me too! Mushrooms are always a hit. I haven’t seen the vegan sausage yet. Does it have good flavor? Hilary’s is great, especially their spicy flavor. And I think you’ll love that the list of ingredients are all clean too. 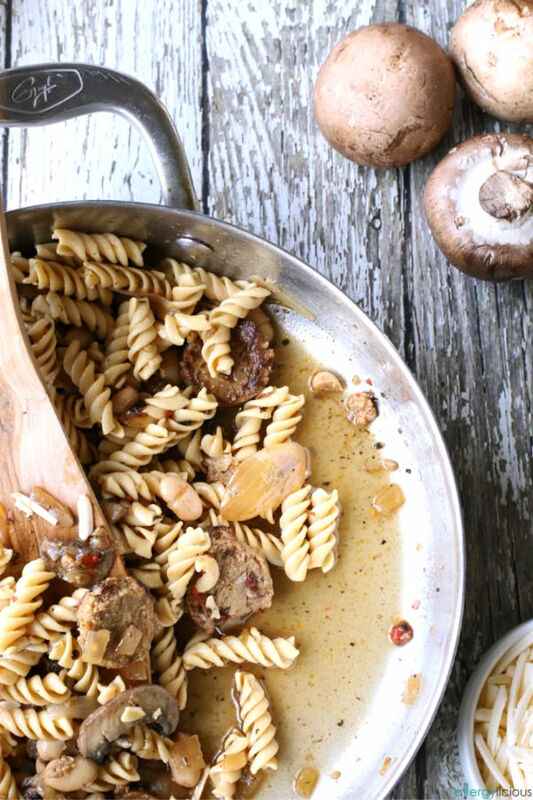 This is such a great hearty fall pasta. I am seriously obsessed with legume pasta, I don’t think I can go back to the regular kind! 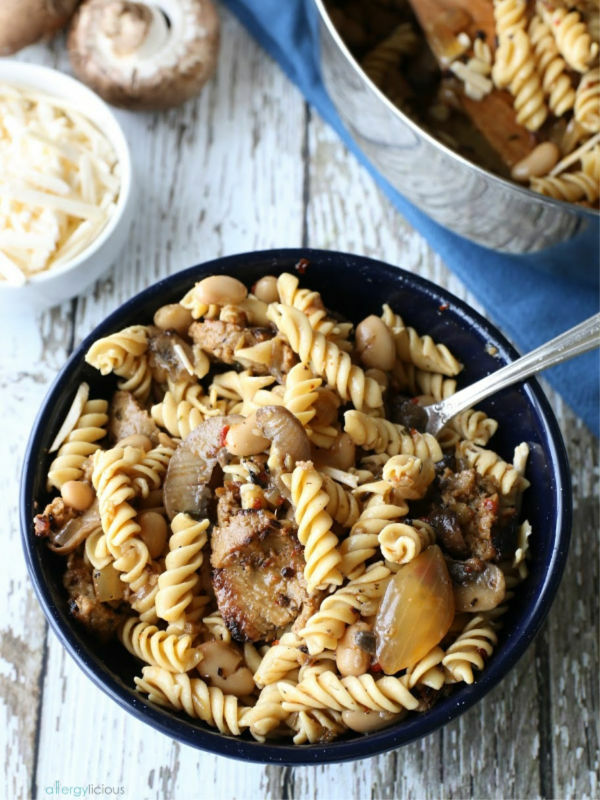 Legume pasta is great for sure! And I love that there’s a ton of protein and plant-based. 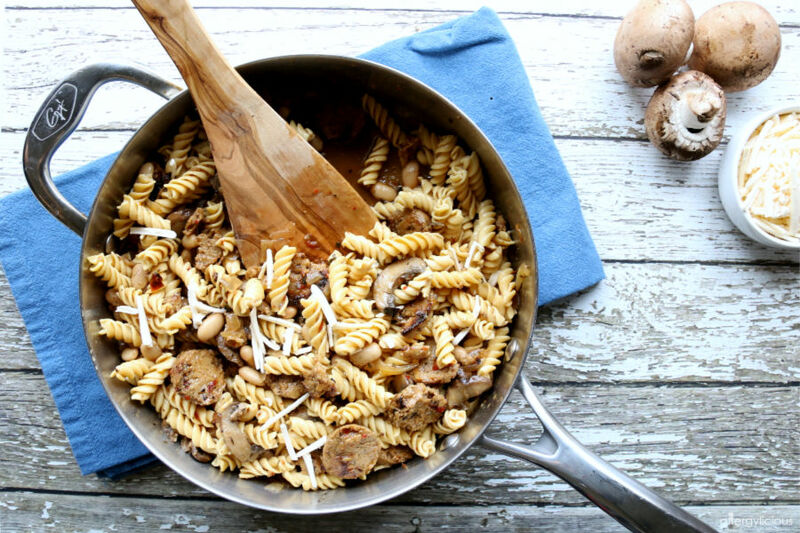 Vegan sausage pasta – I love it! That’s been a favorite in our home so it’s wonderful to see a plant-based option. It’s been great for accommodating my family members who are not vegan too. This meal is perfect. Both Gluten free and vegan while being a great comfort food. I will be making soon. Thanks Kathy…and you’re right…this meal covers several food restrictions without giving up on comfort. We love Barilla Gluten free pasta and add in the vegan sausage, this is great. We are cutting down on meat, so I will enjoy this. Barilla is great also, we have plenty of it in the pantry as well! Using vegan sausage will be a perfect transition when cutting back on meat. Such a great, filling weeknight meal. I always need quick and easy dinner ideas. I love the combo of vegan sausage with mushrooms and cannelloni beans. Can’t wait to try it! Can’t beat an easy dinner for the weekday! Hope you get to add this to your menu soon. Looks and sounds like a hearty fall meal! 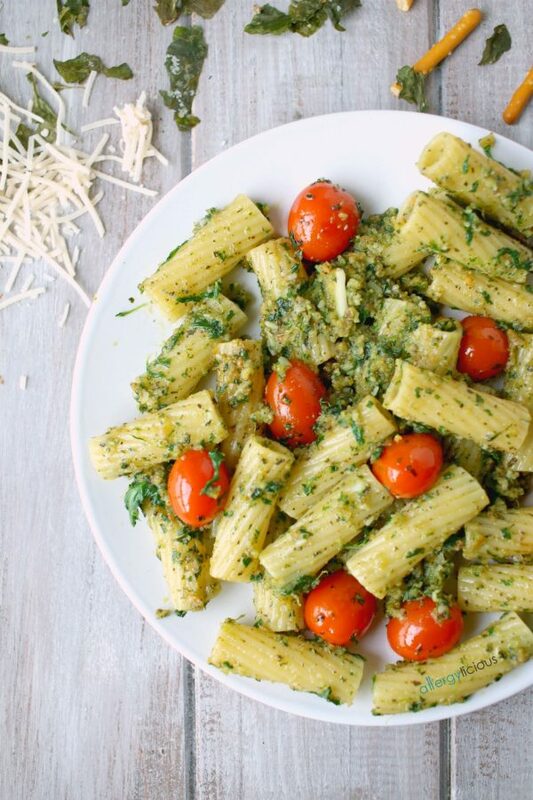 I have never had chickpea pasta, but sounds like I need to try it soon! It’s very hearty and great for warming you up! And yes, you’ll have to give it a try for sure. It tastes great, doesn’t get mushy like normal gf pasta AND has plant-based protein which I love! Haha, I’m glad I’m not the only one. We really like the Field Roast sausages as well so feel free to use those instead. You are right, those are pretty good too. Yum! Thanks for the tip about Hilarys sausage. I’ve never had it before. Of course! I’m excited to hear what you think of Hilary’s. We really enjoy the flavor and texture of it. 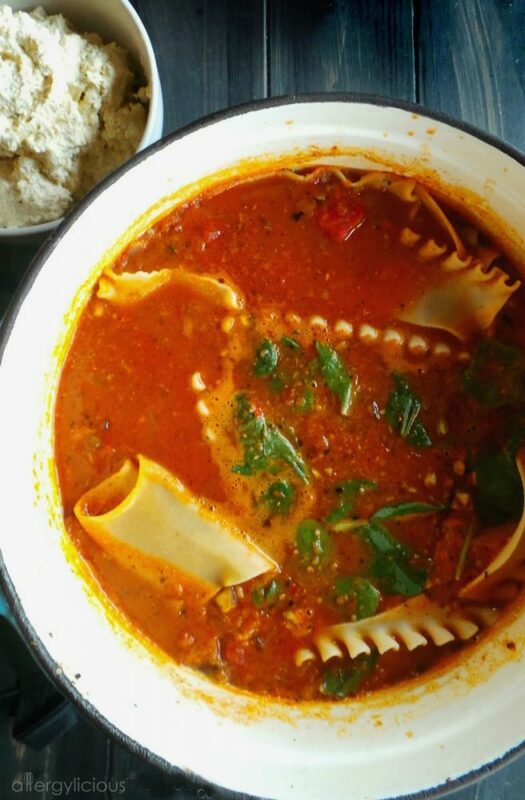 I love pasta, especially in this cold winter season, and your recipe looks to die for! So many comfort foods in one pan!